Ne-Yo and girlfriend Monyetta Shaw have become parents again. The couple, who already have an 11-month-old daughter Madilyn Grace, welcomed their second child on October 10, People reports. The 31-year-old singer and actor said earlier this year he is loving fatherhood. 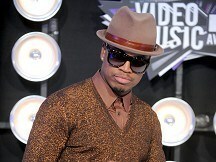 Ne-Yo said: "It has been a ride, but I'm loving every minute of it." And the R'n'B star also revealed Maddie is yet to become a fan of his music. He laughed: "Daddy loses out to Mickey Mouse Clubhouse. She loves the Hot Dog! song by They Might Be Giants. "She knows two words: 'Dada' and 'hot dog'." Sarah Harding is doing "really well" since entering rehab and plans are still afoot for a Girls Aloud reunion, Kimberley Walsh has said. Snow Patrol and Jason Derulo are to perform a free gig in Belfast as part of MTV's Europe Music Awards in the city. Radiohead will be heading into the studio this winter to start recording, frontman Thom Yorke has revealed. Steps have jumped straight to the top of the Official Albums Chart after a decade-long break to claim their third number one album. Boyband Nu Vibe have become the first X Factor act to fall victim to the public vote in this year's competition. Justin Bieber has become the first artist on the Universal Music roster to have part of his album sales benefit a charity.